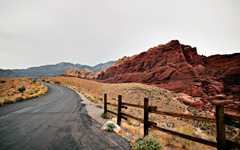 Taken at Red Rock Canyon outside of Las Vegas on an overcast, cloudy day. Canon EOS 500D, Canon EF-S 15-85mm f/3.5-5.6 IS USM shot at f/7.1 for 1/160 second. ACR + Adobe Photoshop CS5. Breathtaking. I just love the color and texture and sense of depth here. It reminds me of the game Shadow of the Colossus, actually (that's always a good thing). 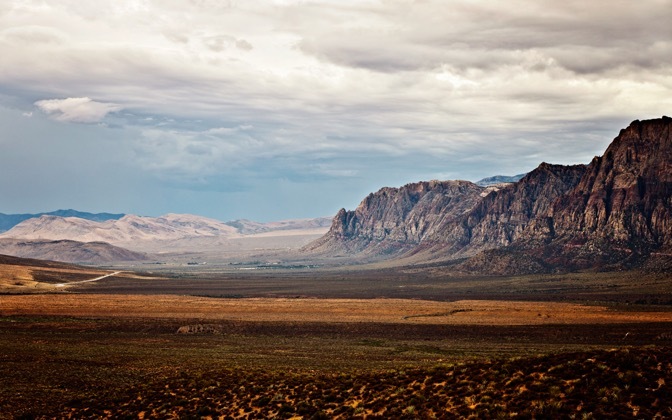 And this is why a few movies especially westerns, are shot around the desert outside of vegas. I can see a little ranch or town set being built here. As for the image itself, I would have also done a little selective color editing to bring out some more deep blues and yellow, then tried a slight smart sharpen filter. The noise isn't really a problem here though and I like the balance of the composition. Shifting to the right to get the road on the left out of the frame might have been an option, but I don't know if what was on the right was any better.